Is Wind Power Better than Solar Energy? At the outset, let us also agree that wind power is more cost effective as compared to solar power for the simple reason that even today, solar photovoltaic cells are fairly expensive to install while their life-cycle is not too lengthy as to make per kilowatt electricity any cheaper. Wind energy, on the other hand uses a wind turbine which is nothing but a glorified electric motor with rotating blades and some gears attached to it. Then there are a few electronic controllers that do not cost much and a battery bank which can be procured from any automobile junk yard. It can jolly well be built at home at a cost of little more than $100. Of course, there are expensive fancy wind turbines costing thousands of dollars but that is an option and not a compulsion. Nevertheless, like solar, wind turbines require no fuel as the wind itself drives the turbine as long as it (the wind) lasts. But unlike solar, it does not go to sleep as soon as the sun goes down but keeps on running and generating electricity 24 x 7 all the year round. Contemporary wind turbines are fairly noiseless, creating very little or no noise at all. Yes there are a few technical challenges, but with continuous research in the field and constant developments, we can only expect that these challenges are going to go away pretty soon. 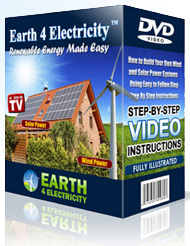 Wind turbines provide uninterrupted electricity to most homes and workplaces in a simple and inexpensive way. They seem to be almost God sent in remote or isolated areas where there is no utility or grid power while many such turbines provide the much needed electricity to research workers studying wildlife habitats in South African Game Reserves. However, wind turbines work best in low density areas where there is free wind all the year round. In contrast, solar power may be installed in high density locations since it is an inert producer of electricity that converts light energy to electrical energy without the help any moving part. But PV or Photovoltaic cells are small, having limited power of producing electric current and so a large number of them are required for generating minimum kilowatt of power. And this is where the cost factor comes into play. In order to cut down cost, and yet have the benefits of solar power, people often install smaller solar panels along with wind turbines since the PV’s will generate power even when the wind dies. Some wiser guys make the system foolproof by connecting the combined power generators to the grid so that when both fail to generate electricity, the grid will come to their rescue. Alternatively, when both function, they will supply power to the grid, earning money for the consumer. But bear in mind, the practical problems of maintaining a solar panel all through the year. Imagine going up the roof on a cold December dawn to scrape off the snow and ice from the solar panel that hangs precariously at the edge. Not much fun for anybody, young or old. You can now install a small wind generator in your home yourself without having to spend too much money or without too much of a hassle. All you need to know is a few simple things such as where it works best, how to set it up and complete the wiring, where to get the parts from cheaply and the safety precautions. This information on wind power system set up will have you going. Being a safe and clean energy, the advantages of wind power (that include both ecological and financial) are simply too much to be ignored. So going for it makes a lot of sense.